The soldiers from Ft. Stoddert, Louisiana Territory, captured the fugitive Aaron Burr on a February morning in 1807, on a muddy road near the hamlet of Wakefield. Burr's fall from grace seemed total. The former vice president, who had dressed as magnificently as any head of state, wore a battered beaver hat and ragged wool coat. The dandy who had charmed women by the score sported a scruffy crop of whiskers. 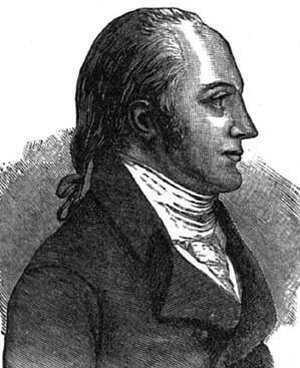 Aaron Burr had traveled West just six months before to carve out his own empire. Now, he would return East to stand trial for treason. Nearly 200 years later, the exact details of what became known as the Burr Conspiracy -- Aaron Burr's attempt to detach the Western states and the Louisiana Territory from the Union -- remain unknown. But the conspiracy probably began some time in early 1804, just months before Burr killed Alexander Hamilton in a duel. Vice President Burr's political hopes in the East were fading by then. And after he killed Alexander Hamilton in a duel on July 11, they would die completely. But Burr saw a chance to revive his fortunes. If the East wouldn't crown him, the West just might. Burr cast his eyes on the newly acquired Territory of Louisiana. The land was mostly unsettled. Its borders were disputed by Spain. And many of its residents talked openly of secession. Burr believed that with a relatively small and well-armed military force, he could pry territory from Louisiana and build his own empire. Perhaps he might even take Mexico. Burr would need manpower to accomplish his objectives. His foremost co-conspirator was General James Wilkinson, Commander-in-Chief of the U.S. Army. Arrogant, unscrupulous, and overly fond of liquor, Wilkinson had befriended Burr during the Revolution. Burr had convinced President Thomas Jefferson to name Wilkinson as governor of Northern Louisiana. Despite his faults, Wilkinson represented a logical choice for Burr. 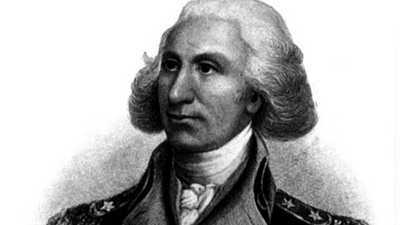 As commander-in chief, Wilkinson controlled the military and could move about the West without suspicion to cultivate alliances. But Burr also trolled the waters for supporters with even more power. In August 1804 the vice president contacted Anthony Merry, Britain's Minister to the United States. Burr offered to help Britain take Western territory from the United States. Merry immediately sent a dispatch to Britain, detailing Burr's offer to "effect a separation of the western part of the United States" from the rest of the country. In return, Burr wanted money and ships to carry out his conquest. In April, 1805, shortly after his term as vice president ended, Burr journeyed West on a reconnaissance mission. In town after town, he dropped hints of the expedition to come. And in town after town, he met men that he believed would support him in his enterprise. One of these men, Harman Blennerhassett, would prove a loyal follower. Blennerhassett, an eccentric Irish gentleman, had come to the United States with a fortune in hand. On a small island in the Ohio River near Marietta, he had built himself a mansion. There, with his wife and children, he lived a life of luxury. But thanks to Aaron Burr's scheme, Blennerhassett's paradise would soon crumble. Burr continued his Western odyssey, visiting with Wilkinson at a western fort and dropping south to New Orleans. By the time Burr returned to Washington in November, he had enlisted a number of supporters, including former U.S. Senator Jonathan Dayton and members of the Mexico Society, a group of New Orleans businessmen who favored annexation of Mexican territory in the West. Still, problems remained. Support from the British had not yet arrived. In fact, it never would -- nor would assistance from Spain. Perhaps worse, rumors about Burr's plans had begun to circulate and had even been published in Eastern newspapers. Unshaken, Burr continued his quest for support. Meanwhile, the border conflict with Spain had begun to heat up. This fit perfectly into Burr's plan. Jefferson would order Wilkinson to Louisiana with U.S. troops. In the name of U.S. sovereignty, Wilkinson and Burr could attack Texas or even Mexico. Burr could then declare himself ruler of the conquered lands. At last ready to move forward, Burr sent a coded letter to Wilkinson outlining his plans. The document would become known as the Cipher Letter, and would figure prominently at Burr's treason trial. Burr set out from Pittsburgh in August, 1806. His first stop was Blennerhassett's, where he ordered the Irishman to outfit his island as a military encampment. As Burr hobnobbed around Ohio, Kentucky, and Tennessee, the trickle of rumors about him became a torrent. Particularly problematic for Burr was the U.S. Court in Frankfort, Kentucky. Burr was called by the court three times to answer charges of treason. Each time he was acquitted. By the beginning of December, 1806, Burr's plan was in total collapse, although he didn't know it. Wilkinson, who by now believed Burr's plan would fail, opted to save his own hide. On October 9, he had sent a letter to President Thomas Jefferson outlining the conspiracy, but without naming Burr. Jefferson responded with a cease and desist order. Burr was not named specifically, but he didn't need to be. The newspapers were full of treason talk, and Burr's name was prominently featured. On December 9, 1806, authorities struck the first blow against Burr. Ohio militiamen captured most of his boats and supplies at a Marietta boatyard. On December 11, the militia raided Blennerhassett's Island, but most of the men had already fled downriver. Blennerhassett's mansion was ransacked. When Burr rendezvoused with Blennerhassett on the Ohio River near the end of December, he expected to meet a small army. Instead, he met a force of less than 100 men. A less ambitious (or wiser) leader would have quit. But Burr proceeded, picking up what new recruits he could as they drifted down the Mississippi. At Bayou Pierre, just 30 miles above New Orleans, the final blow came. A friend handed Burr a New Orleans newspaper. It announced a reward for the capture of Aaron Burr and reproduced in full a translation of the coded letter Burr had sent to Wilkinson. Burr surrendered to authorities at Bayou Pierre and was arraigned before a grand jury. Burr and his men insisted that they had no intention of attacking U.S. territory, and the jury failed to return an indictment. Still, one of the two judges involved in the case ordered Burr returned to the courtroom. Convinced he would be railroaded, Burr fled into the wilderness. On February 13, 1807, a soaking wet and bedraggled Burr was captured and carried back to the federal court at Richmond, Virginia, to face trial for treason. This was truly the trial of the century, and Aaron Burr battled for his life. Both the prosecution and the defense used the Cipher Letter to try and prove their case. But in the end, the Cipher Letter took a back seat to another, even more renowned document: the Constitution, which defines treason very specifically. Supreme Court Justice John Marshall insisted on absolute adherence to this strict definition -- which Burr's actions did not meet. And so he was acquitted. But if Burr was victorious in court, he lost in the court of public opinion. Across America he was burned in effigy. Several states filed additional charges against him, and he lived in fear for his life. Wisely, Burr fled again -- this time to Europe, where he tried without success to convince Britain and France to support other North American invasion plots. After four years in exile, Aaron Burr returned to America again. In mid-1812, the country was on the brink of war with Britain, and the Burr Conspiracy seemed ancient history. Aaron Burr put up his shingle in New York as an attorney and found ready business. He would live the rest of his life in relative obscurity, his dreams of empire forever undone. Learn more about the Federalist Party and the Republican Party. Maria Reynolds was 23 at the time; Hamilton was 34. Their affair would make headlines — and temporarily strip Hamilton of his political power.